Everythingneon is proud to present vintage style neon art with our line of Art Deco neon signs! These are modeled after the unmistakable old fashioned diner and movie marquee neon signs. They are a wonder to behold with their clean painted steel finish, chrome accents and tiered style appearance. Our wide selection of these Art Deco inspired signs is impressive, and all are engineered with top notch craftsmanship and quality. These signs stand out as a tribute to older style neon signs, and are perfect for those who remember the good old days and have a deep nostalgia for a simpler time. Easy assembly with a screwdriver is required to attach the top tier into the bottom section. Instructions and all necessary parts are included. Equipped with two I-holes in the back of the unit for easy hanging. For indoor use only. 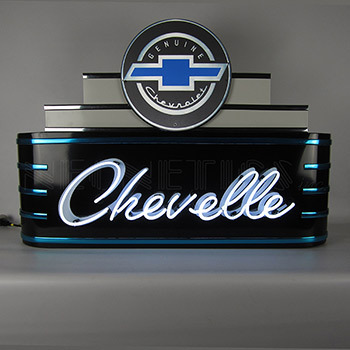 Art Deco Marquee Chevelle Neon Sign In Steel CanJust want to compliment you, I received my neon sign and I loved it.Thank you so much.I am super excited to see my sign hanging on the wall of my Bar.